✔ Comes with 100 white string light bulbs. ✔ Better aesthetics offered by matching green colored wire. ✔ Multi-functional - Steady Burning mode and 2 Way Flashing Mode. ✔ 19 feet lighting string with 2" space between bulbs. ✔ Patio Decoration or even to decorate tree bushes and fences. ORDER NOW and get this incredible lighting string delivered to you. Bright Clear White Mini String Lights for Indoor & Outdoor Use - UL Listed. Makes a great decoration gift. 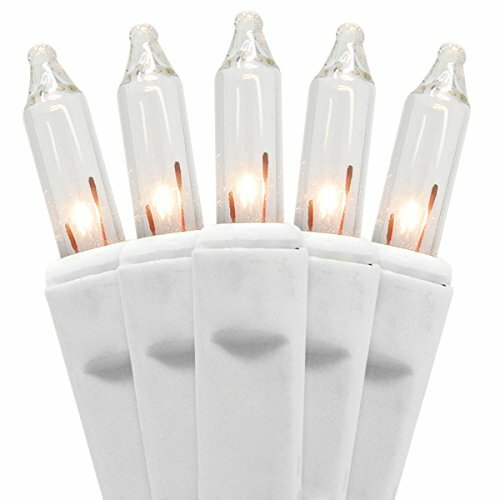 You Can Safely Connect up to 5 of these Light Sets. Perfect set for decorating christmas trees, patio lawn garden, parties, holidays, wedding props, bedroom, home and kitchen, and more.